In 1941, Dusty Boots Riding Club, as a social organization, was formed to create interest in riding, training, and care of horses. In 1944, the club held their first horse show at the county fairgrounds. Always showing a good profit due to the work and sacrifice of it's members and co-operation of area merchants, the club was able to purchase 5.5 acres of land on Garrison Road (near Ashtabula). The land was cleared and a riding ring built and graded for the first annual show held on October 26, 1945. The proceeds from this show were used to purchase the top story of an old cheese factory, which was transported to the Garrison Road location and remodeled to give it a clubhouse atmosphere. In 1948, Dusty Boots was incorporated as a non-profit organization with the purpose of promoting sociability, horsemanship, breeding, training, owning, and showing of horses. These things were to be done by holding shows, sales, and other events in the interest of horses and their owners. In the years to follow, monies from the annual shows brought many improvements to the grounds. Announcer's stand, food stand, calf roping pens, practice ring, and electrical wiring were added in the early years. The show ring over the years, went from woven wire, to snow fence, to board fence, and finally split rail fence. Later improvements included updated lighting and modern restrooms. In 1980, with membership declining in recent years, the idea of promoting interest and participation in the local horse shows was brought to the attention of the Dusty Boots membership. It was decided to start a local open circuit and give end of the season awards to top point accumulators at the approved shows, as the breed associations do. 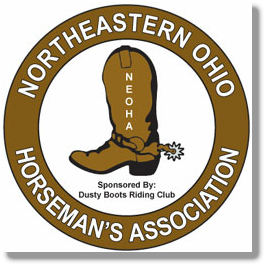 The Northeastern Ohio Horseman's Association was organized, rules established, and shows with approved classes sanctioned. The first year end banquet brought to a close a successful season. Since it's formation, the NEOHA rules have been refined and classes modified to suit the interest of the membership. The association has stimulated interest not only in Ashtabula County, but also in surrounding counties of Ohio and Pennsylvania. The limited space at the Garrison Road showgrounds became a problem as the horse shows grew larger and larger. Most of the shows are now held at the Ashtabula County Fairgrounds. In the mid-1990s, the Garrison Road property was sold and the Dusty Boots Riding Club now hold their meetings on the first Wednesday of each month in Jefferson, Ohio, please join us soon.